FeastHome – An elegant style and minimalist style is one of the best combinations. This combination is very suitable for you who love elegance but do not want it to look too much. An elegant minimalist style is also one of the most popular styles nowadays. This style is the most used style in this modern era. 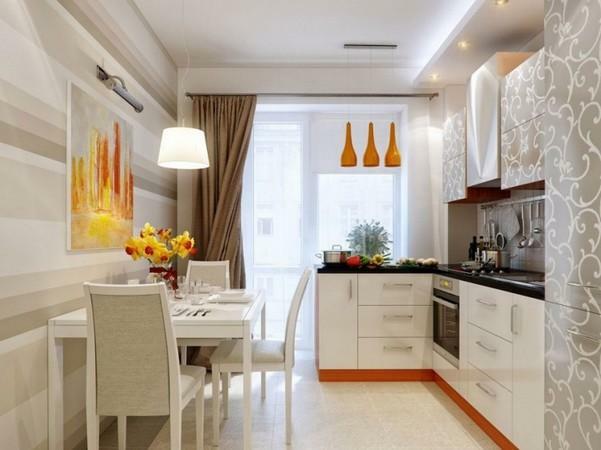 Moreover, an elegant minimalist style can be applied in any room in a house, even in a kitchen. Are you curious how to apply an elegant minimalist style in a kitchen? Look these inspirations below. As it is said before, an elegant minimalist style is the most used style in the modern era. It is because this style is able to create a modern touch. Look at this kitchen. It looks so simple, minimalist, and modern at the same time. It is because the one-colored kitchen elements used, from the kitchen cabinets, countertop, cooker hood, fridge, and many more. Those one-colored kitchen elements used are also bringing an elegance to this kitchen, added by the hidden lamps and highlight lamps, making the elegant style looks strong. 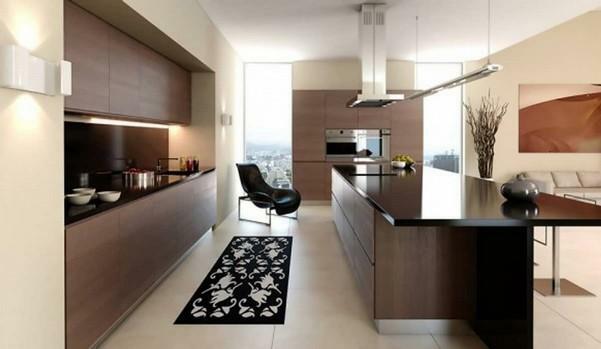 You can use any materials to create an elegant minimalist style for your kitchen. You can even use a wood material which is mostly related to a natural and traditional style in order to apply the style. Just like this kitchen, the householders use a dark brown tonewood for the kitchen cabinets combined with a black countertop. Black and dark brown are still in a close tone so that it creates a minimalist look. The use of a patterned rug in the area accentuates the elegant style but still looks minimalist because of the color. Added by the chair that looks simple yet has an office look. Here is a tip for instantly creating an elegant minimalist look: use white as a dominant color. This kitchen is dominated by white, making it looks very simple and minimalist. The patterned wallpaper is also very simple which is still in the same tone with white. But the shape of the dining chairs, the silver patterned kitchen cabinets, and the big curtain insert the elegant look. This kitchen area is quite small, but the big glass window allows the sunlight to come into the area, making it looks more spacious. The hidden lamps reflect the silver kitchen cabinets so that the elegant style strongly comes out. And the painting is used in order to make the kitchen more stylish. 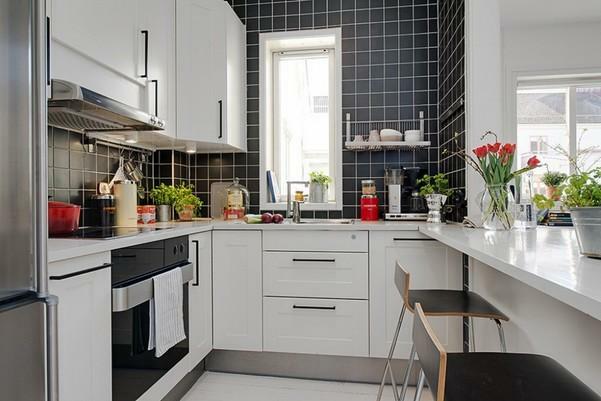 The minimalist style comes out in this kitchen idea because of the monochrome design used. Monochrome design of black and white is able to instantly create a minimalist look. Even though the area is small, but the householders divide the kitchen area and dining area very well. This idea can be your inspiration if you have a small kitchen. You just have to use the all sides of your kitchen to place the kitchen and dining elements. 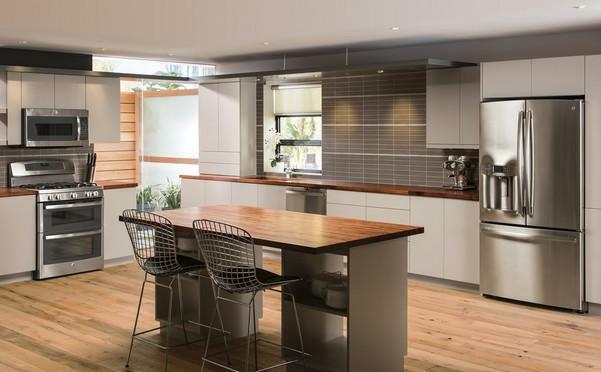 The dining chairs in this kitchen are very modern and beneficial to save spaces. Moreover, the plaid patterned kitchen wall is used so that the area looks less boring. 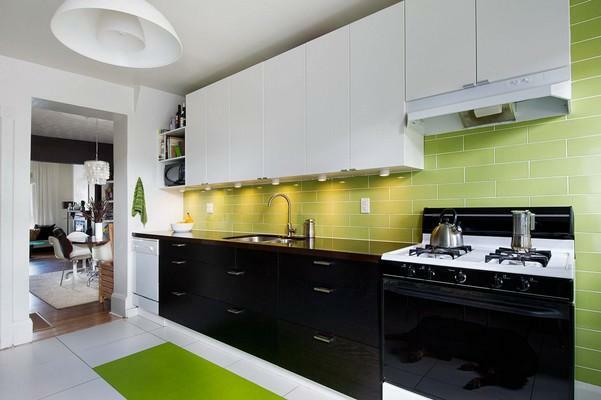 The green olive color from the kitchen wall and rug add a little bit of colorful touch, making this kitchen looks more attractive. But the black color from the countertop, kitchen cabinets at the bottom, and stove, and white color from the wall built-in kitchen cabinets carry the minimalist touch. The hidden lamps that only light the countertop area are able to save the electricity bill. 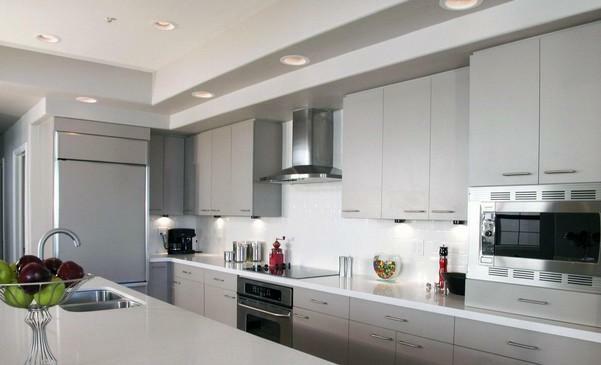 The medium tone of grey that dominates this kitchen area really creates an elegant minimalist style. The white color used for the wall built-in kitchen cabinets is able to add color in this area without ruining the elegant minimalist look. The householders use a stainless steel sink with a purpose to blend it well with the dominating medium tone of grey. Moreover, the lighting used in this kitchen area makes it looks very elegant. If you have a quite spacious kitchen area in your house, you can follow this idea. The wood material used for the kitchen floor, dining table, and countertop are creating a warm touch in this area. Making it looks homier. But the stainless steel fridge and stove insert a modern look. 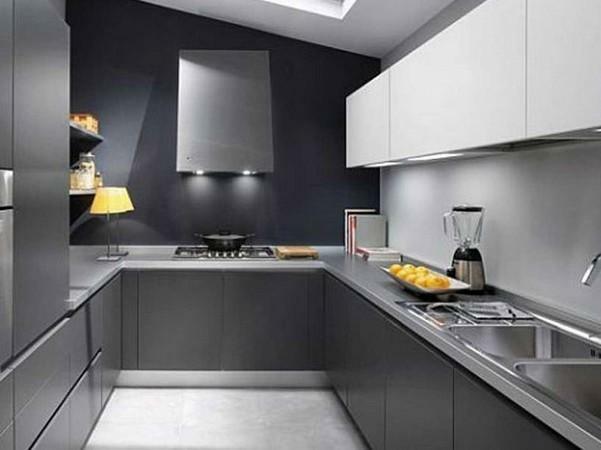 The householders use the grey patterned kitchen wall in order to match it with the stainless steel color. And the unique dining chairs used to make this kitchen looks more attractive. This kitchen area looks so vivid because of the use of white as the dominant color. From the countertop, kitchen cabinets, and kitchen wall. 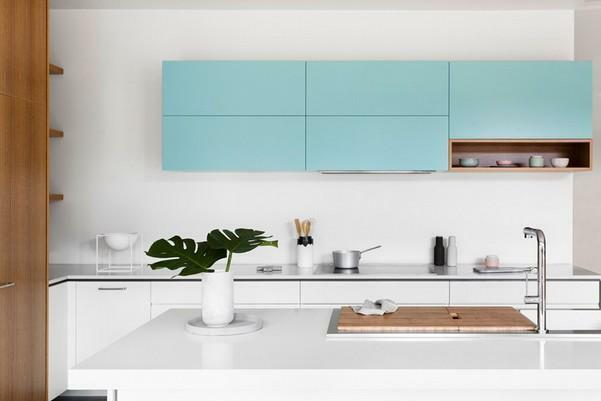 The wall built-in kitchen cabinets with a baby blue color are installed in order to add colors, but they still perfectly matches with the design. The kitchen sets and kitchen utensils are neatly stored inside the kitchen cabinets so that the area looks very clean and minimalist. A simple plant is placed in order to make the area looks sweeter. The area of this kitchen is already large, but the white color which dominates the kitchen area added by the big glass window are making this kitchen area looks even more spacious. The big glass window is able to allow the natural sunlight comes into the area so that the householders can minimize the use of lamps, especially during morning and day. The householders combine white and natural light brown from the wood material in order to create a simple minimalist style. And look at the unique hanging lamp, it inserts an elegant touch to the area. 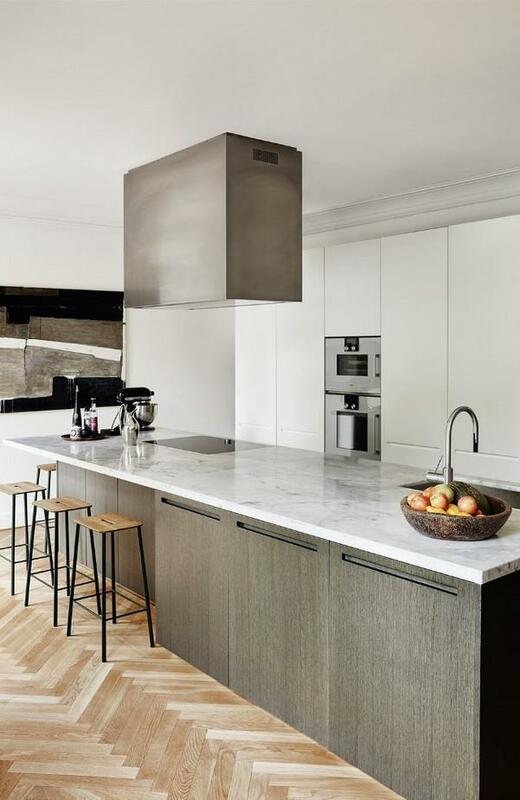 The pattern of the wooden kitchen floor and marble countertop blends really well. The wooden kitchen floor is matching with the wooden dining chairs. And the grey countertop is matching with the stainless steel kitchen elements such as built-in stove, oven, and cook hood. The simple mix easily creates a modern look in this kitchen. 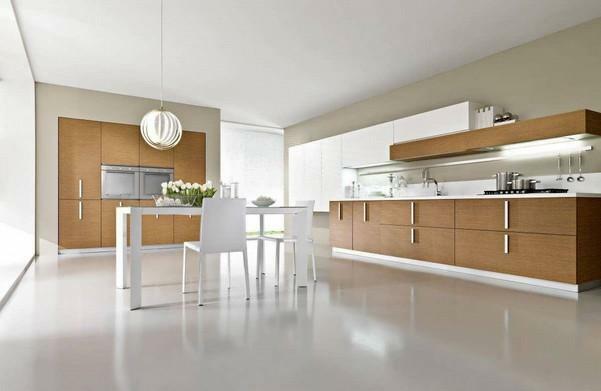 An elegant minimalist style can make various looks so that do not doubt to apply this style to your kitchen.